Law & Society by Chester Cabalza: Terrorism’s Paradox in Marawi: How Will It End? 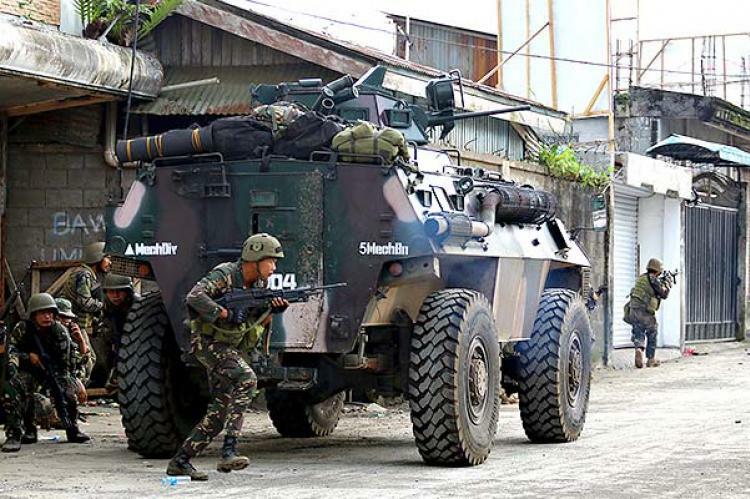 Terrorism’s Paradox in Marawi: How Will It End? (Copyright @ 2017 by Chester B Cabalza. All Rights Reserved). Prince Hamlet’s soliloquy in William Shakespeare’s famous one-liner opening phrase, “to be or not to be?” paints a backdrop of the forbidding scenario that still looms many Filipinos’ consternation about the fate of Marawi under the IS-inspired terrorist groups. It bespeaks sorrow and pain that bemoans myriad of death of Filipinos – be it civilians, soldiers, and terrorists. The realism in Russian novelist Leo Tolstoy’s epic masterpiece on ‘War and Peace’ downplays Philippine contemporary period parallel to machinations of violent battles in the name of a false united caliphate, power play of superpowers in aid of counterterrorism measures, and the usurpation of legal power of statesmen vested with political will to crush terrorism visible to fallen Marawi City. The irony sows a harrowing inquiry on the role of the Philippine security sector in training Filipino soldiers as prescribed by policymakers on the orientation and reorientation of tactical operations and strategies in solving the Marawi conundrum. Should soldiers become peace builders or war fighters amid heavy causes of jihadi terrorism? This current quandary is the biggest challenge to date for the Philippine government on its bid to stabilize internal insecurity that reckons a “wake up call” for the defense sector to constantly train and educate the military. Prior to 9/11 the Philippines has been combating terrorism as it dwelt the nontraditional security threat as forms of multi-faceted phenomenon dissecting it from the prisms of cultural, historical, legal, philosophical, political, psychological, and technological lenses. It resembles an iceberg constituting the tip of shocking attacks with wide base founding substantial concerns on the persistence of religious radicalization and poverty. To annihilate and wipe out an iceberg, one must destroy it from the base. Similarly, terrorism should be treated properly to conscientiously address the issues that support the tip. More than three months of fierce fighting with the jihadi terrorists in urban setting in Marawi has caused the Armed Forces of the Philippines a big ‘Black Hawk Down’ trap despite precedence of urban rebellion during the Zamboanga siege in 2013. Failure of intelligence sharing and interoperability were attributed to the weakness of military operations to contain immediately the terrorist cells in Mindanao. More than that, myriad of soldiers and military officers felt short of the redirection that the military’s principal duty is to fight war and to win it by hook or by crook. Terrorism in Marawi has changed the rules of the game of war as Filipino soldiers continuously struggle to win the war at home. Military doctrines must evolve to be armed with hybrid and unconventional strategies to counter the sophisticated tactics acquired by jihadi terrorists in a well-planned crucible. The abstract of ideology intrigues everyone as it allows believers to make sense of the world around them. It arms them with values, moral frameworks, and the ability to understand and add meanings in relations. More so, the apparent contest of ideology brings a winning chance to local terrorists in their holistic approach not only to sow their goodwill in their own perspective as to give hope to the poor and neglected people of Mindanao but also their mastery of geography and training in urban warfare remain an advantage. With the global paradigm shifts of war studies to peace studies in trying to bridge the conflicting ideologues in military education, to some extent prescribing developmental dimensions as the key solution to the complex and changing security landscape, nonetheless, this rhetoric will not bring immediate stability in Marawi. Terrorists do not subscribe to either school of thought rather they will deconstruct the order in meeting the means to justify the end. Sowing terrorism breeds unethical norms at the expense of the populace that permeates disorder to unearth rancor and grievance to the misfortune of the government. The synergy of action from the defense sector to professionalize the Philippine military is underscored to value higher education that must be based on wisdom that the security landscape requires a transformation in education and development of broad competencies. The dilemma of a war fighting and peace building formal education must transcend beyond the volatility of defense and security but rather it should emerge as a catalyst of change in protecting the survival of nations and peoples. There are no good templates from around the world to substantiate the resolution of terrorism in Mindanao. The Marawi siege is a case of its own that must become a lesson to all that terrorism is indeed real in Southeast Asia and across the globe.